Citation Information: J Clin Invest. 2007;117(4):850-858. https://doi.org/10.1172/JCI30920. The discovery of the molecular basis of sickle cell disease was an important landmark in molecular medicine. The modern tools of molecular and cellular biology have refined our understanding of its pathophysiology and facilitated the development of new therapies. In this review, we discuss some of the important advances in this field and the impediments that limit the impact of these advances. Peripheral blood smear from a patient with SCD obtained during a routine clinic visit. 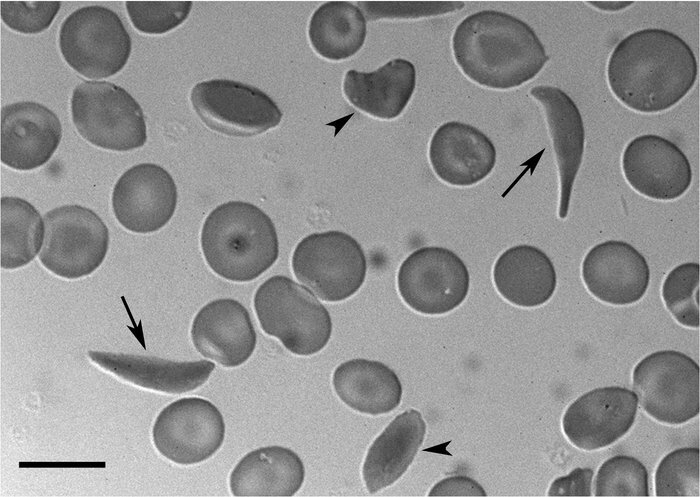 The smear shows classical sickle-shaped (arrows) and various other misshaped erythrocytes (arrowheads). The image was obtained from an air-dried smear using differential interference contrast (DIC) microscopy with an Olympus BX61WI work station equipped with a LUMPlanFI ×60 numerical aperture 0.90 ∞ objective (Olympus) and a CoolSnap HQ camera (6.6 μm2 pixel, 1,392 × 1,040 pixel format) (Roper Scientific). Scale bar: 10 μm.